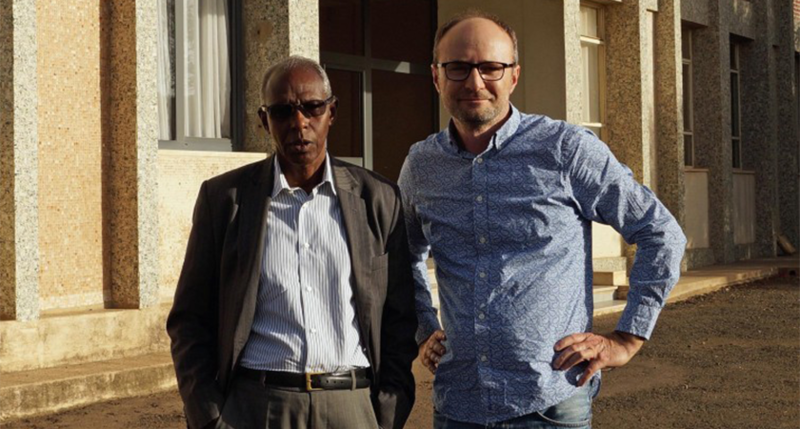 An insightful conversation between Deutschlandfunk radio reporter Oliver Ramme and Yemane Gebreab, Presidential adviser and head of the People’s Front for Democracy and Justice (PFDJ). Yemane Gebreab is an important figure in Eritrean politics. He is the personal adviser to President Isaias Afewerki. Some see him as a gray eminence, others consider him as the second most powerful man in the state of Eritrea. Our reporter met him – listen here the entire conversation. The interview took place in March 2016 in Asmara inside the party building, the single allowed party in the country, the People’s Front for Democracy and Justice – PFDJ. The party ruled since independence in 1993 from Ethiopia. In the conversation, Gebreab draws a detailed balance sheet of the country after 25 years of independence (the defeat of the Derg regime in 1991 in Ethiopia is considered by many Eritreans as a great step towards independence). It’s about the tense relationship between Ethiopia and Eritrea. Asmara feels patronized by the big neighbor. Also, there are questions about the controversial “National Service“, where young Eritreans are partly conscripted for years. The advisor defends the National Service against international criticism. The service contributes to social unity and the protection of the border. Eritrea is – according Gebreab – victim of an intrigue and misunderstood. Eritrea is in the headlines because of the high number of refugees – Gebreab judged that it is about democracy deficits, speech and press freedom.. Even the thorny issue of political prisoners is addressed. As shabians have a policy of self realization or self reliance, why does needs to be supported from the west if shabia have friends in Arab world??? Why is shabia not to becoming a full partner to the community of democratic nations? Shabia is issolated for Regional cooperation for economic prosperity, why is shabians belive the “UN-Justed” in the view of shabians can fix the curently economical issue in Hagerna if non-west would like to have any Relation with shabia? Very frank and educational interview. Hi five to comrade Yemane. This is the best interview well said Yemane. Very impressive and crystal clear answers by Mr Yemane Ghebreab. This is what solid and visionary leadership offers. If, according to Meles, listening to President Isaias for an hour is like going to university, what would it be listening to the very people who make our president as strong as he is? There are more nuggets there, just come and listen. So sad .. we’re used to the disrespect by all officials .. but Monkey surpasses all of them … lying in broad day light as if we’ve a transparent government … time will tell .. God help our people! Have you succeeded in getting help for yourself from God? Would you agree that you can love your country and as eritrean you can give constructive criticism of the government, as well as leaders of the government. I agree that you can love your country and at the same time give constructive criticism of your government & leaders. It is a wonderful thing. However, when someone (@Tess Mehari) is complaining being disrespected by Eritrean officials, while himself disrespecting one of our best Eritrean official (Yemane Gebreab) by calling him Monkey is not what I call Constructive Criticism. I have no respect for anyone who disrespects Eritrean government or any Eritrean official. P.S. Dissent could be the highest form of patriotism, provided your are on the correct side of the opinion. Remember, many Eritreans who are in the so called “opposition” camp, considered as dissenting from the opinion of the majority Eritreans, may not even be patriotic. It is good to be patriotic but at the same you have to be Truthful” and Realistic” and we should be objective besides criticizing constructively. 1)Why has the the 1994 EPLF Congress been frozen? 2)Why was Vet Romedan Mamed Nur demoted? 3)Why was the National Assembly frozen? 4)Why did PIA refuse to call for or to resume the quarterly Assembly Congress? 4)Why is the Ratified Constotution frozen and now,killed? A)Why is the Private Economic Sector banned? B)Why is the Private Education System banned? 5)How in the az Nation or Gov keep des sidebars or opponents in communicado without a single day in Court or without a single chance to defend themselves? Ato Yemane blamed the G-11 for the Ethio-Eritrea War and the loss of 20K ERITREANS ! Can U buy this ? If so,how and why and in what sense? The G-11 were never involved in the war and if they were involved,our EDF could have repeated history by capturing Mekeke and Addis. 6)Why can’t the families of the kidnapped and jailed allowed to visit their fathers,Ms,Sisters,Brothers,Soms.’cDaughters,Grandmothers and Grandfathers,etc… and vice versa? Do U have a family members,who is killed,kidnapped,jailed,disappeared,kept in communicado,arrested with out a day in the Court? If so,what do U feel? If not,U have nopal ground to defend the killers,the kidnappers,the jailers,the arresters,etc…even to talk about this issue..
-Why aren’t we doing something about the Youth Exodus including basic Policy Modifications on the economy and Education? -Why cannot we modify the National Service in away that cannot compromise our National Security Interest? I bet Yemane Gebreab lost 10 lbs during this difficult interview. To the contrary, we gained 10 pounds, thanks to his articulate & clear responses. I hear you, but he did exceptionally well. He’s an impressive strategist, exemplified by his clarity. Oliver Ramme, the interviewer of Deutschlandfunk Radio, was also very understanding. He would push so much and would let go when he realized further pressure wouldn’t bear any fruit. It appeared that he understood that it is very, very difficult to justify a dictatorship of any kind and impossible to rationalize why somebody would be kept behind bars for the last 15 years without being given an opportunity to defend himself in a court of law — whether it be in military tribunal or civilian court. Professor Yemane is a living proof on why the leadership of Shaebia is what it is, Forever Strong!!! How are PFDJ leaders different than any other African leaders? Were the G15 army commanders during the 1998-2000 war,??? Was Yemane/monkey in the army at the 1998-2000 war, where on earth, never in his life! What kind of justice is Yemane is talking about, “I know you don’t know” WHAT? Every word are impressive and fact truth and clear like spring water or crystal clear .Thank you excellent interview full of knowledge .